(August 25, 1943 - February 25, 2009) was an American poet, essayist, memoirist, and musician. Holm was born on a farm in north Minnesota and attended Gustavus Adolphus College in St. Peter, Minnesota. He was Professor Emeritus of English at Southwest Minnesota State University, where he taught classes on poetry and literature until his retirement. Holm was named the McKnight Distinguished Artist of the Year in 2008. This award celebrates artists who have left a significant imprint on the culture of Minnesota. He received Minnesota Book Awards in 1991 and 1997. For his service to Iceland, he earned the Sue M. Cobb Award for Exemplary Diplomatic Service in 2003. In 1991, Gustavus Adolphus College awarded Holm a Distinguished Alumni Citation and in 2002 he received an honorary doctorate. 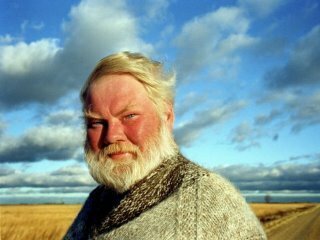 He was the grandson of Icelandic immigrants and spent part of every year at his second home in Hofsós, Iceland.